Frank R. Paul was born Rudolph Franz Paul on April 18, 1884 in the district of Radkersburg, Austria. The Austro-Hungarian Empire was formed only seventeen years before the artist's birth. It was a dual monarchy, created as a compromise settlement after a volatile history of military conflict. The two kingdoms enforced an oppressive dominion over their neighboring states in the unruly Balkan region. The district of Radkersburg, is in the most south eastern corner of Austria, on the three-nation border with Hungary and Slovenia. It was established as an outpost with a military garrison to defend the Austrian border. The ancestry of the artist's family reflected this cultural diversity. The children were raised speaking both German and Hungarian. The names of the artist's father and mother are not known, but according to the artist, his father was Austrian and his mother was Hungarian. However, when asked the same question on another occasion, he said his father was Hungarian and his mother was Slovenian. On the other hand, the artist's sister always listed both parents as Austrians living in Vienna. The artist's parents married in 1880 and had three children, the eldest daughter (b.1881), whose name is not known, Johanna Marie Paul (b.1883), and Rudolph Franz Paul (b.1884). The family attended Catholic church. The father's occupation is also unknown. According to the artist's son, Robert Spencer Frank (1914-2006), "My father started drawing when he was a kid, but he didn't do anything about it. Apparently it just came to him naturally. It was a gift that he was able to draw, because to my knowledge he did not go to any art schools. The only schooling he had was in Austria." According to the artist, his highest level of education was the completion of the 8th Grade in 1898 in Austria at the age of fourteen. Unless they came from the most prosperous families, this was the customary amount of schooling for most children before they entered the work force. In 1898 Frank R. Paul became a laborer at a paper mill, manufacturing newsprint, in Graz, Austria, which is fifty miles north from Radkersburg along the Mur River. In 1900 the world's fourth largest industrial power, after America, Germany, and England, was the Austro-Hungarian Empire. They built railroads, canals, bridges, shipping, giant machines for factories, and advanced equipment for the telegraph, telephone, and electrical industries. In 1901, Frank R. Paul, at the age of seventeen, left Austria to avoid compulsory military conscription in the Austrian Army. He traveled by train to Paris, France, where he visited the spectacular Paris World's Exposition, which celebrated the triumph of scientific and industrial wonders. He supported himself by working as a waiter. He learned to speak French and English fluently. He visited art museums in Paris and London. In 1905 the artist's sister, Johanna Marie Paul, left Austria and moved to America, where she had been hired to work as a house maid. After two years she moved to San Francisco to work as a self-employed seamstress. In 1907 Frank R. Paul met Armand Claude Morand. He was born June 2, 1886 in New York City. His parents were both born in France, and worked as servants in a hotel in Passaic, New Jersey, where he was raised. At the age of twelve his father became the head waiter at a hotel in Boston, Massachusetts, where the family moved. By the age of twenty-one, Armand Claude Morand was also a head waiter at a hotel in Boston. Oddly enough, along with his service profession, he was also a creative designer of practical inventions, for which he held several patents, including a music stand, a book holder, a mechanical page turner, and a child's play suit. In 1907, at the age of twenty-one, he wanted to spend some time in the mother country, so his father arranged a job for him as a waiter at a hotel in Paris, France. Frank R. Paul was also a waiter at the same hotel, and the two young men became fast friends. In 1908 the two pals decided to leave France and earn their passage to America. They planned to visit San Francisco, where Frank R. Paul's sister lived. They joined the crew of a ship leaving Marseilles, France. They worked as a waiters as they sailed around the world. According to the artist's son, "My father had no particular goal in mind. He only knew that he wanted to get to San Francisco eventually, because he had a sister there." In 1909 the ship arrived in California, and the two pals visited Johanna M. Paul at 264 Waller Street. After a few weeks, Armand C. Morand had fallen in love with Frank R. Paul's sister, so decided to stay in California. He rented a room in a lodging house at 959 Rhode Island Street, while Frank R. Paul continued to live with his sister. Thanks to their experience as waiters, both pals found work at a local hotel. In 1910 Frank R. Paul and his sister were recorded by the U.S. Census as still living together in San Francisco. His citizenship was identified as an "Alien with Working Papers." The 1911 and 1912 the San Francisco Business Directory listed "Frank R. Paul, waiter" and "Johanna M. Paul, dressmaker" living together at 1624 Sacramento Street. It is noteworthy that during his three years in San Francisco, Frank R. Paul was continuously employed as a waiter at a hotel. There is no document or record to indicate any intention to pursue a career in commercial art. 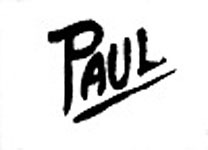 Although it has not been documented, it is likely that Frank R. Paul earned a little supplemental income as a free-lance artist by providing illustrations to some minor local newspaper. However, when asked to identify his occupation in the San Francisco Business Directory, he never chose to be listed as "artist" instead of "waiter." On February 2, 1912 The San Francisco Call reported "Shoes Pawned For $1; Return Costs Man $2.50 - Frank Paul told Police Judge Weller yesterday that he entered the store of Sol Schneider, 1119 Grant Avenue, on Saturday and pawned his shoes for $1. Later, having secured $5, he returned to the place and requested his shoes. Schneider said for $3 he would return them. In the scuffle which followed Schneider got the shoes and had Paul arrested for petty larceny. Judge Weller told the two to divide the $5 and the case was dismissed." The very next day, February 3, 1912, The San Francisco Chronicle reported a marriage license had been issued to A. C. Morand and Johanna Paul. The married couple moved to their own apartment, and their only child, Yvonne Marie Morand, was born one year later on April 7, 1913. After his sister's marriage Frank R. Paul, was on his own. On April 18, 1912, he turned twenty-eight. After ten years of work as a waiter in both Paris and San Francisco, he suddenly decided to embark on a new career path. He left California and moved to the East Coast to seek his fortune as a commercial artist. It is worth noting that he settled outside of NYC, across the Hudson River, in New Jersey, in the exact area where Armand C. Morand happened to have spent his childhood. According to the artist's son, "In 1912 he left San Francisco and went East, because that was the center of publishing in the country, and in fact he went to work originally for the Jersey Journal." At that time there was a nationwide expansion in the newspaper industry. 1912 was before the invention of an affordable rotogravure process, so most newspapers employed large numbers of artists to hand produce designs, decorations, lettering, advertisements, portraits, illustrations, comics, puzzles, and editorial cartoons. Entry-level newspaper artists only needed a natural talent for drawing, rather than a degree in academic art training. Most of their work was published without credit or signature, but after several years in apprenticeship, many hoped to become celebrated newspaper artists, such as Charles Dana Gibson (1867-1944), Richard Felton Outcault (1863-1928), and Winsor McKay (1869-1934). At first Frank R. Paul produced anonymous decorations, lettering, and advertising copy for The Jersey Journal, of Jersey City. After several months of work he produced his earliest credited illustration, which was an editorial cartoon published on November 11, 1912. According to the artist's son, "My father and my mother met in Jersey City. He happened to be renting a room in the same house where she was renting a room." Rudolpha Catherine Rigelsen was born September 6, 1886 in Antwerp, Belgium, to parents of Norwegian and Danish ancestry. She came to America in 1904 to work as a governess for a wealthy family of Clarence Hungerford Mackay (1874-1938), president of the Postal Telegraph and Commercial Cable Company, as well as the Mackay Radio and Telegraph Company. She joined a staff of twenty-two servants in the family mansion, Harbor Hill, in Roslyn, Long Island. The grand home was designed by Stanford White (1853-1906) of McKim Mead and White. After six years she left that job and moved to Jersey City, NJ. In May of 1913 Frank R. Paul, age twenty-nine, married Rudolpha Catherine Rigelsen, age twenty-seven. They lived at 100 Romaine Avenue in Jersey City. One year later, on March 10, 1914, their son, Robert Spencer Paul, was born. In 1914 the Jersey City Business Directory listed "Frank R. Paul - artist" at 100 Romaine Avenue. He preferred to work as a free-lance artist, instead of a staff artist. 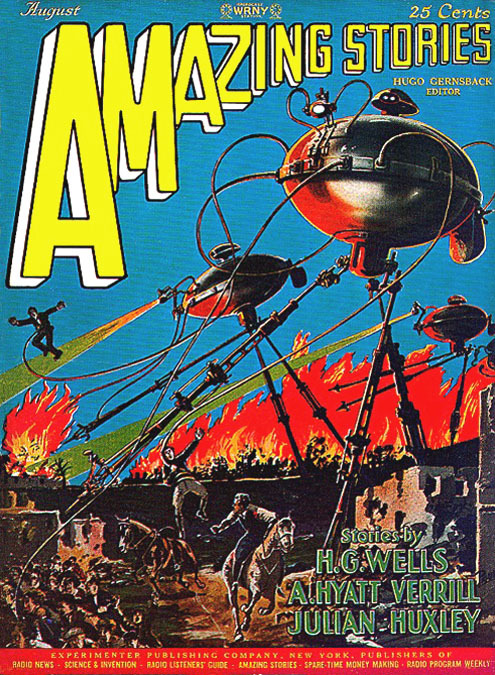 He soon found jobs with a variety of publishers through an art agency in New York City, where he was discovered by Hugo Gernsback in 1914. 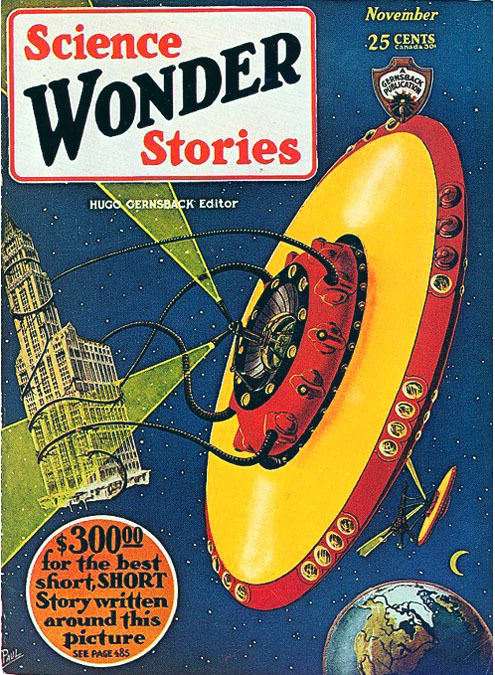 Hugo Gernsback (1884-1967) was born in Luxembourg, and came to America in 1904. He and Frank R. Paul were both the same age and both spoke German as their native language. Hugo Gernsback worked in New York City as an importer of electronic goods. 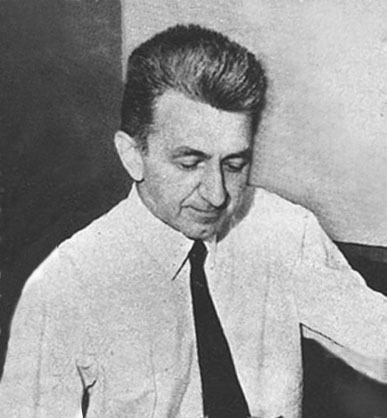 To stimulate sales, he produced Electrical Experimenter Magazine, which was an electronic parts mail order catalog, which also featured articles on projects and fiction for electronic hobbyists. 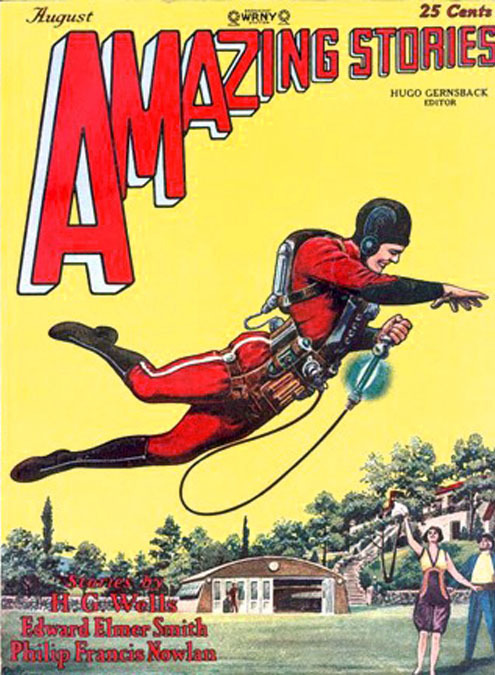 Frank R. Paul began to contribute illustrations to this magazine in 1914. In 1915 the New Jersey State Census recorded Frank R. Paul, with his wife and son, living at 1161 Seventh Avenue in Jersey City. In 1915 Frank R. Paul opened a NYC art studio at 95 Liberty Street, which is just north of Trinity Church in Lower Manhattan. He commuted from Jersey City to work in NYC by ferry boat across the Hudson River. On July 2, 1918 his daughter Francis Louise Paul was born. On September 12, 1918 Frank R. Paul registered for the draft as required by law during the Great War. At the age of thirty-four, married, with children, he was not selected for military service. In 1920 the family moved to 56 Woodcliff Avenue in Washington, NJ. On November 13, 1921 his daughter Joan Catherine Paul was born. 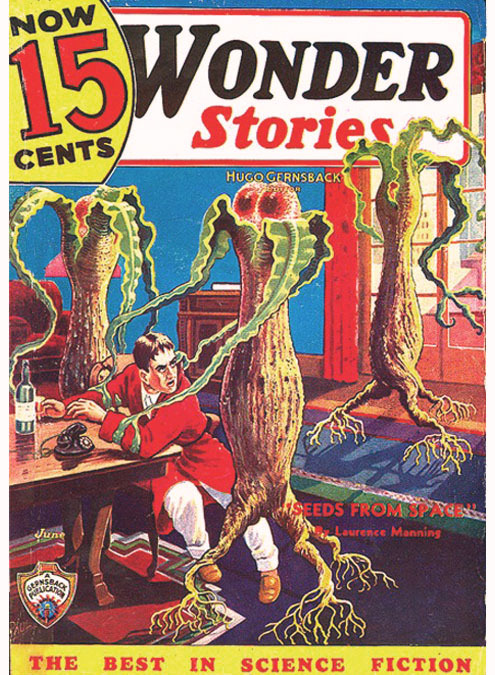 Along with painting the cover for Gernsback's first issue of Amazing Stories in April 1926, Frank R. Paul also drew all interior story illustrations. 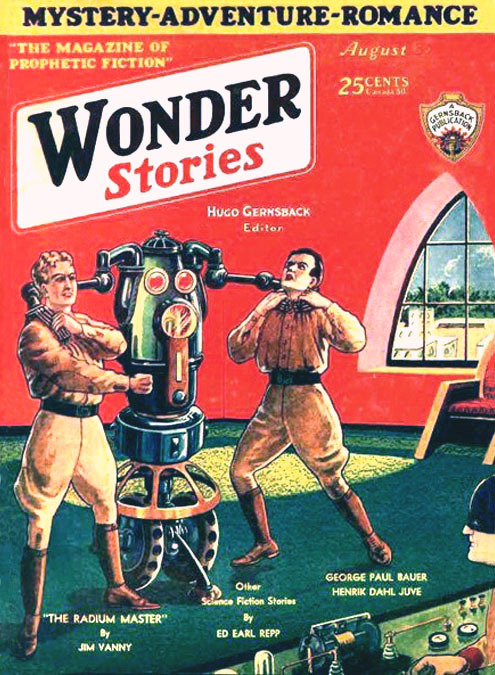 Frank R. Paul spent the rest of his life as the primary artist on most Gernsback publications, including Science Wonder Stories, Air Wonder Stories, and Wonder Stories. In 1928 the Paul family moved to a twenty-five acre property on Park Ridge Road in Rivervale, NJ, where he designed and built a ten-room house. The property had a brook running through it, as well as forested areas of standing timber. On April 11, 1929 his youngest daughter, Patricia Ann Paul, was born. 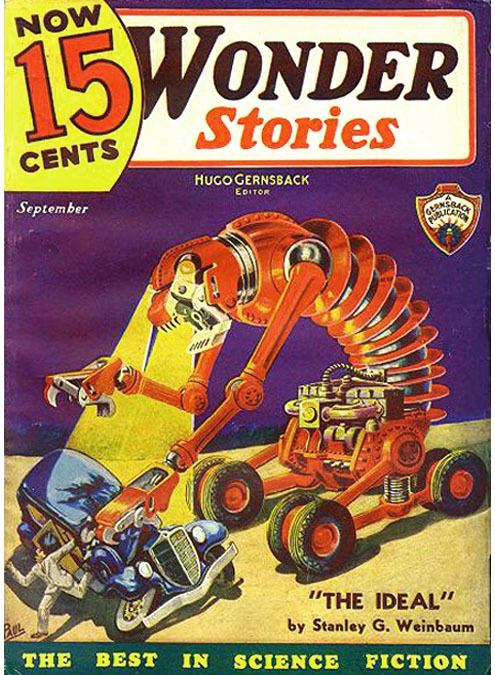 Eastern Distributing Company handled the many publications of Hugo Gernsback, an ambitious publisher with significant debts. 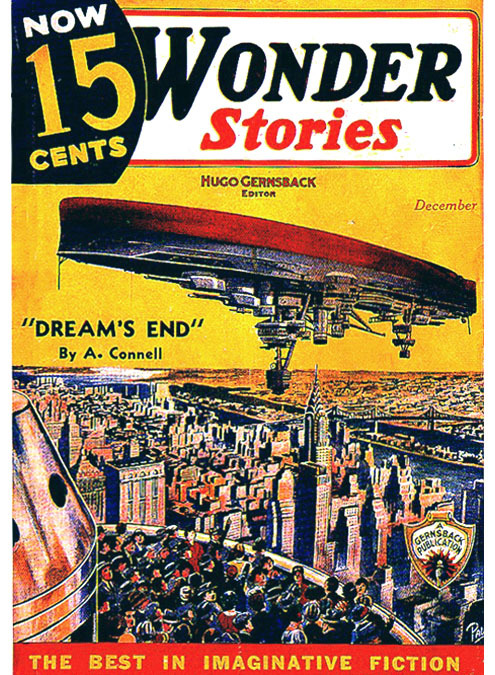 On February 21, 1929 Hugo Gernsback declared bankruptcy. During subsequent negotiations he accepted the offer of credit in exchange for control of his vast company, which was reorganized by the owners of Eastern Distributing, Paul Sampliner and Warren Angel, in cooperation with a financial syndicate, whose members included Bernarr Macfadden, William M. Clayton, Moses Annenberg, and William Randolph Hearst. They split the business into several independent companies, whose names included Stellar Publications, Teck Publishing, Forward Publications, Experimenter Publications, Modern Publications, and Grenpark Novelties. 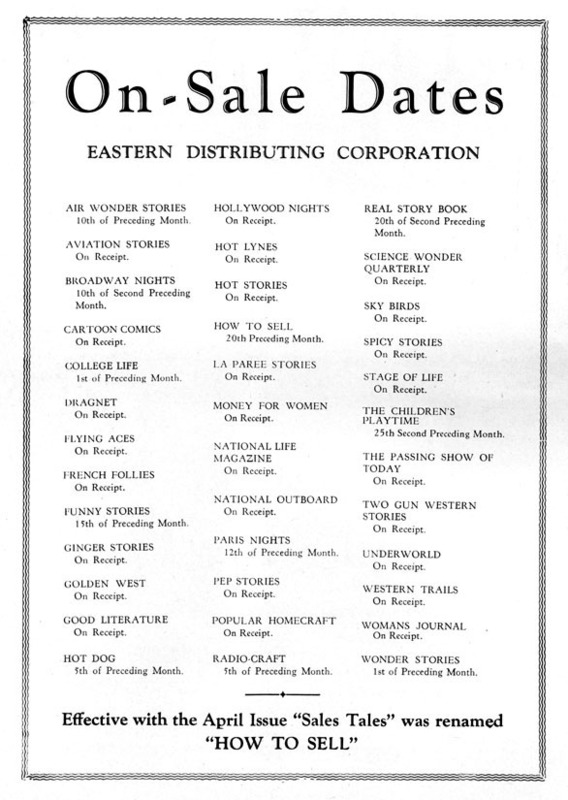 The executive officers of these various companies included Hugo Gernsback, Bernarr Macfadden, William M. Clayton, , Theodore Epstein, Harry Donenfeld, Frank Armer, and Harold Hersey, while the production and distribution was handled by Eastern Distributing. 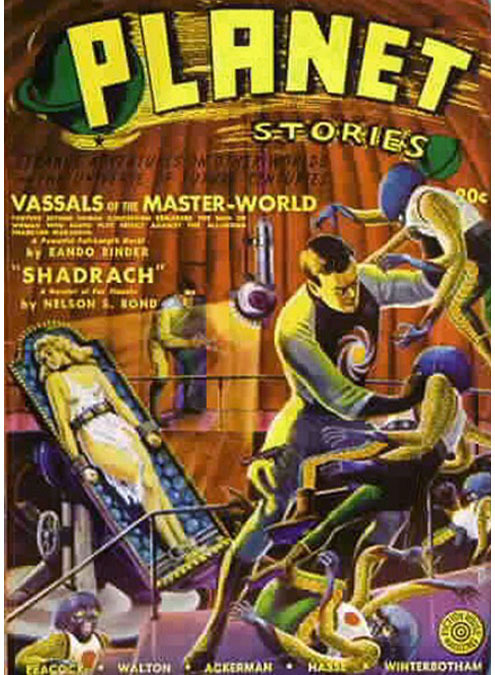 Because of these new business associates Frank R. Paul began to illustrate pulp magazines from affiliated publishers, such as Ned Pines and Martin Goodman. During the Great Depression Frank R. Paul attempted to win a mural commission from the WPA for the new Rivervale Municipal Building. According to the artist's own account, "I had hoped to paint the murals in order to get enough money to pay my property taxes and the interest I owed on a $7000 property mortgage, but the project was never approved. After submitting my designs to the Mayor, I never received a word about the project - not even an acknowledgment of receipt." He lost the family property in Rivervale, NJ, in 1938, after which he left New Jersey and moved with his wife and young daughter, Patricia Ann Paul, to NYC at 317 West 85th Street. His other three children had grown up and started their own families. The January 1939 issue of Family Circle featured a cover story on Frank R. Paul. 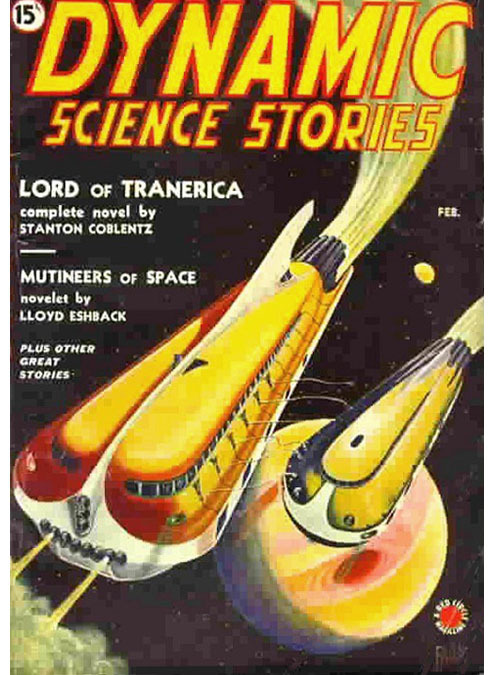 In defense of his seemingly outrageous images in science fiction magazines, the artist was quoted,"When I run into a story so bizarre that it seems to have too much of a much-ness, I remind myself that our great-great-grandfathers would have pooh-poohed prophesies of radio and television and aviation." Frank R. Paul submitted a design proposal for a mammoth statue as the figurehead of the 1939 NYC World's Fair. Unfortunately his design was rejected in favor of the iconic trylon and perisphere. 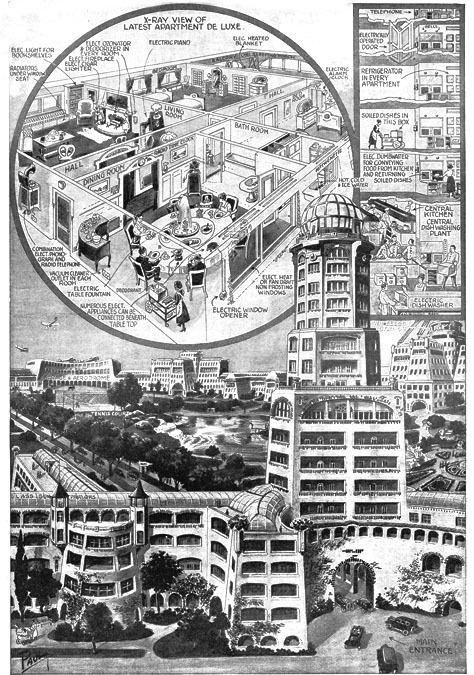 Frank R. Paul supplemented his income by accepting assignments from architects to create isometric visualizations of planned buildings. These paintings were used to show the public and clients what a completed project might look like. According to legend, Frank R. Paul was hired in 1938 to paint a rendering for the famous Johnson Wax Building in Racine, Wisconsin, which was designed by Frank Lloyd Wright (1867-1959). By 1941 Frank R. Paul had moved to 426 East 84th Street in the Yorkville section of the Upper East Side of Manhattan. The neighborhood was traditionally known for its large German community. He worked at a rented studio at 154 Nassau Street, which is downtown one block below City Hall. This was conveniently located for commuting on the Lexington Avenue IRT express train, which made the trip in only four stops. This new studio was a few blocks north from his previous studio on Liberty Street near Trinity Church. On April 25 1942 Frank R. Paul registered with the draft board, as required by law, and was recorded to be five-ten, 160 pounds, with gray eyes, gray hair, and a light complexion. At the age of fifty-seven he was too old for military service. During WWII he worked for national defense as a draftsman in shipyards. 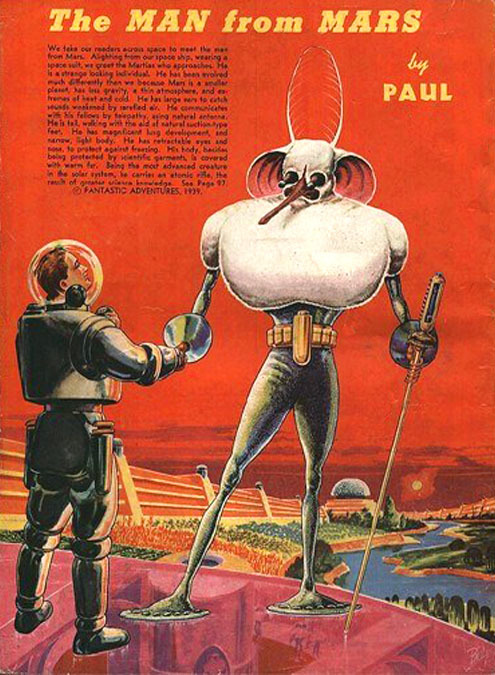 According to Ray Bradbury, "As for me, Frank R. Paul romanced me with future architectures when I was eight, summoning me to cities lost in the Time Ahead until he landed me in shocks of joy, in the colored facades and high-rises of the Chicago World's Fair." On August 26, 1950 his daughter Patricia married and moved to Teaneck, NJ. After a while Frank R. Paul and his wife left NYC and moved to 700 Cedar Lane in Teaneck to be near their daughter's family. He never retired from illustration. Frank R. Paul died at the age of seventy-nine on June 29, 1963 in Teaneck, NJ. Eighteen years later, on October 1, 1981, his wife, Rudolpha C. Paul, died at the age of ninety-five in New Jersey.